Who better than Stewart, leaders in projection screen technology, to come up with the perfect entertainment solution that addresses the growing trend in outdoor living? 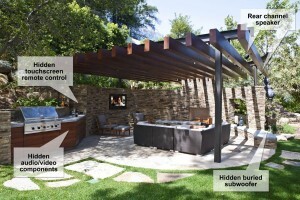 Stewart’s weather-resistant Oasis is capable of creating an exciting, upcale outdoor living space. 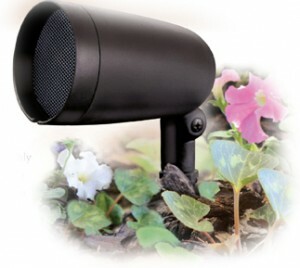 Many of our clients, particularly women are worried that the speakers will clash with the plants and outdoor decor. To this concern we say, check out the Ambisonic, SoniScape speaker and subwolfer solutions. They are made to fit right in. Until now outdoor subwoofers have been lacking in their musical prowess. The 10SW Subsonic-Woofer delivers powerful deep bass frequencies that are the foundation of the SoniScape System’s remarkable performance. The sealed PVC enclosure is installed below ground, with only its attractive solid copper canopy visible. The canopy is also available with a patina finish and a lighting option. Difficult site conditions are no problem. The 10SW can be easily installed at varying depths below the ground surface. This unheard of versatility, coupled with unmatched front-firing bandpass performance, puts the Model 10SW In-Ground Subsonic-Woofer in a class unto itself. SoniScape Outdoor Systems produce a richly dimensional, evenly dispersed sound field in an otherwise uncontrolled environment. This is accomplished through an array of strategically placed Satellight loudspeakers and powerful subwoolfers. The Model 3.5 F is the primary workhorse of the SoniScape System delivering richly-detailed audiophile quality sound. With various finish options and many unique installation accessories, the 3.5F can be positioned in trees, hidden in planting beds, or concealed along walkways. Look no further if you desire great sound in a sleek, inconspicuous speaker that will blend in with just about any environment.